The first book in which we used digital printing for images was The Bricks of Venice, whose extended text was illustrated by digital reproductions of over seventy watercolours, and which sold out quite quickly. 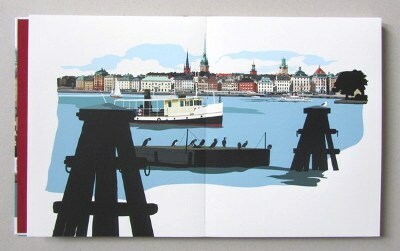 In our latest publication, Stockholm Reflections, the letterpress definitely plays second fiddle to Leslie Gerry's stunning images of Stockholm's waterfront, images now originated digitally as well as being printed digitally in vibrant colour, and we expect it to sell at least as quickly as Bricks. 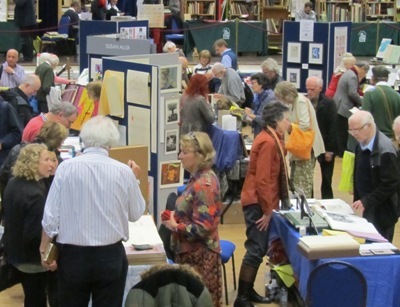 It had its first outing at the 2013 Oxford Fine Press Book Fair last weekend (see below) and was very much appreciated. One visitor to our stand even called it 'the nicest book at the fair'! Our binders - Ludlow Bookbinders - did a great job to get the first 25 copies ready, delivering them to our stand on the Saturday morning. So I can now post some photos of the book. Here are two, but you can find more at our website. There are just 95 copies, of which 89 are for sale. 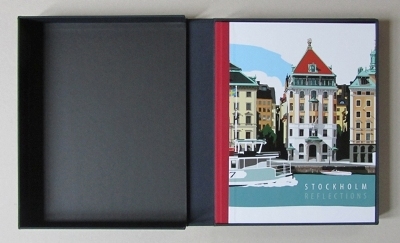 The price is £295 (euro370, USD490) per copy. If you are a press Subscriber, your copy has either been shipped or will be in the coming weeks as we get further copies bound - the first tranche sold out rather quickly! Once again, a great event. The problem is always that we can be so busy on our stand (and running the Sunday lecture programme) that we get little chance to get around the other stands - it's impossible not to start talking at any you stop at, and suddenly time has flown by. 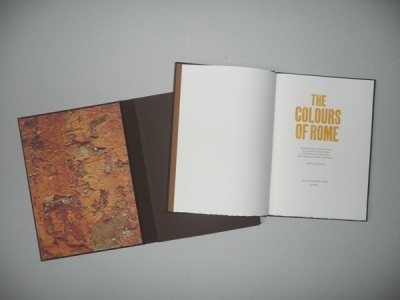 One additional pleasure was that our recent book, The Colours of Rome, won one of the five Judges' Choice Awards. I shall be giving an illustrated lecture to the Oxford Bibliographical Society next week. In the one hundred years from around 1660 the University Press grew from almost nothing to one of the largest printing houses in the country and even in Europe. My talk will map out the development of the Press over the first forty years from 1660 in terms of its premises, people, paper, and type. The talk is open to all-comers and is free. We have a spread in Caroline Mornement's recent publication. Our books are clearly at the, shall we say, more conventional end of the spectrum of book making. Lots of fun and originality, as well as some serious statements.